I’m sure that every married woman in Korea is feeling the pressure… after all, Korean thanksgiving is just a few days away and it means slavery! The pressure is greatest for the first daughter-in-law of the family… Korean holidays are the reason why you shouldn’t marry a first son! Chuseok (chu-seok) or Korean thanksgiving is celebrated on the 15th day of the eighth month (August 15) of the lunar calendar. This year, it will fall on September 18th but the holiday starts from the 17th and ends on the 19th. Unfortunately (or shall I say fortunately? ), we’re just going to have a three-day holiday. That translates to heavy traffic on Saturday when people from Seoul will start their exodus to the provinces and on Monday on the way back. Remember that about a quarter of the total population (45 million) of Korea lives in the capital city. My brothers-in-law have decided to go to the province by train. So we’ll have to take our car on Friday since we also have to bring their things with us. My husband’s family is quite big… three sons and a daughter (that’s already big in Korea). They are all married… my husband’s the third son so my responsibility isn’t that big. Married daughters in a family join their in-laws for these occassions. They are stricken off the (original) family register when they get married and becomes a part of their husband’s family. Anyway, we will just buy gifts for his parents and nothing for the rest :D. My first sister-in-law (keun hyongnim) will be my mother-in-law’s (omonim) right hand when it comes to food preparation and grocery shopping. I and my second sister-in-law (chageun hyongnim) will just help with setting the table since the guys will be the dishwashers. Normally, the men don’t do anything but the situation is quite different in my husband’s family. Aside from the hardwork and the traffic, “Chu-seok” is also a financial burden. In the early morning of thanksgiving day, the family (or shall I say the women?) prepares for “jesa” or “ancestral rites” to honor the dead. There are specific foods that needed to be served in special dishes or wares meant for the rite alone. We haven’t spent for this occassion, but my husband said that 200,000 KRW ($200) is enough. In my husband’s family, we only have to spend this much three times a year… seollal (Chinese New Year), chuseok (thanksgiving) and family jesa (should have been seven times but my father-in-law thought it impractical to do so). The men, in their black suits, perform this ceremony first… bowing in front of the altar (with tons of food offered for their ancestors) several times. The women in my family are asked to do the same as well. Of course, you should be presentable and in our case we wear the “han-bok” or the traditional Korean dress. Korean women despise this because it’s difficult to put on but I like it for some reason… maybe because they hated it? After the jesa on thanksgiving day, we have breakfast. It takes about two hours to prepare for the jesa, so imagine waking up at 6 AM and having breakfast at 9 AM? Koreans don’t usually eat breakfast the way we do… coffee and pandesal first before a heavier meal of fried rice and dried fish or egg. So during this time, I try to wake up earlier than everybody so that I can have a piece of bread or fruit before the work. After breakfast, we pack some foods and go to the mountains to pay respects to their ancestors’ graves. Previous Post:Kim Sun Ah (a.k.a. Kim Sam Soon) in the flesh! hahaha, what happened? i thought the inlaws are coming to seoul? hehehe, i have another sked of interview with arirang, but passed it on to you…okay lang ba? heniwey, goodluck with your chuseok! aja aja fighting! you know, this reminds mo one time of a documentary I was watching when I was still in Pinas. I was surprised to know that there is a Korean School for women who are marrying Americans. Teaching Korean women about American culture, food, clothing, etc. Even with this school, Korean women are still taught to be submissive. 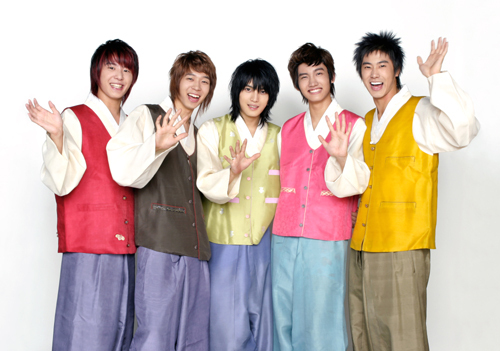 annabananing >> happy chuseok… galingan mo ha! betchay, happy belated chuseouk! how was the celebration? This is first time i heard about Chu Seok, I wonder how do you feel about the pressure of preparing for chu seok? Wow,this is the first time I’m learning on Korean’s occasion. It sounds complicated but at the same times looks like fun. Although all the hassle that need to be gone through, I believe this is a good way where you can gather with all your family members and spends your precious time with them. I always wondered, when is the Korean Thanksgiving day? I often thought it was just an American thing. It is interesting to have such occasion where it is equivalent of Thanksgiving, and a time to honor ancestors with newly harvested grains and fruits. But i heard that this is more of social and function, where they look forward to seeing their families and friends. Kids dress up in new hanbok, or traditional Korean dress, that are picked out especially for the occasion. This is fascinating stuff! Thanks for sharing your experience of Korean thanksgiving… I had no idea what it was like! .-= Rachel´s last blog ..Patrick Swayze Biography â€“ â€˜The Last Danceâ€™ Review =-. please visit and post ur comments. thanks. godbless. Nice blog. Giving me a real good insight in your thoughts. Thank you for that.